The Jade Buddha Temple houses two exceptional Buddha statues, each exquisitely carved from a single piece of white jade. The temple's architectural design is also very impressive. 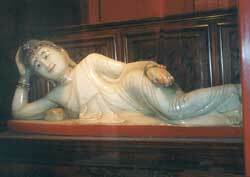 One of the two is of Buddha in a reclining posture (see photo). It depicts the moment when he was leaving earth to enter Nirvana. His skin appears to emit an inner glow. The statue is approximately one meter (3 feet) long. The other famous statue is of Buddha in a seated position, the point of his enlightenment. The statue is bejeweled and is about two meters (6 feet) in height. The temple also has a reclining Buddha statue twice the length of the famous one. Don't confuse them, as some tourists do. The large one is not an artistic masterpiece. To avoid the crowds, go early or late in the day - and definitely not on weekends.